The FCC rulings mandate that cellular phones without a monthly service contract be able to make free 911 calls. This is all possible because these 911 cellular phones are programmed to meet the new FCC 911 cellular rules effective December 1, 1997. These new FCC rules mandate that cellular phones without a monthly service contract be able to make free 911 calls any where in the US. The FCC cellular 911 ruling takes effect December 1, 1997 and requires carriers to accept 911 calls from non-validated phones (not activated with a monthly service contract) and forward the cellular 911 call to the local public safety answering point PSAP (911 answering center). These “911 only” emergency phones do not receive calls. Emergency 911 cellular phones are warranted for 12 months. Our most popular model is the 209VX. The model 209VX is an economical and vandal-resistant approach to an out door emergency phone installation. It requires no phone service fee because it makes free 911 calls. It includes a Nema 4X type water proof, corrosion protection, secure side latch, large call 911 sign, 911 emergency cell phone, and laminated operation instructions with anti-theft warning message. The 911 emergency cell phone runs on a lithium ion cell phone battery and as a power supply back up, long lasting alkaline batteries that last over 24 months. 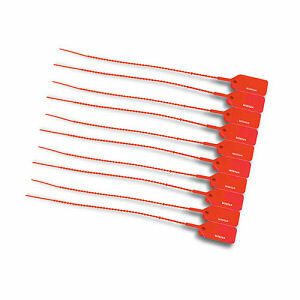 Includes 10 tamper resistant seals for door snap latch (with low effort tear off in case of emergency). Plan maintenance on an annual basis or more frequent if the phone is tampered with or used to make calls. Follow the maintenance process on the inside of the enclosure. The maintenance process for the system includes using the addition lithium ion cell phone battery supplied with the system and AC charger to remotely charge the phone battery annually as a backup to the alkaline batteries. The phone comes tethered with a stainless steel cable (rated at 45 pounds) to the inside of the enclosure for loss protection. Comes complete with emergency 911 Phone label. This cabinet is rated Nema 4X for indoor and outdoor use. Inside enclosure dimensions: H x W x D 10 x 8 x 5.59. If your emergency 911 phone has been irretrievably lost, stolen or destroyed, within one year of the purchase date, you may replace it for one-half the present catalogue price, plus shipping. To place an emergency cellular 911 call press the numbers 911 and then press the send button. These are the toughest cellular phones and protective waterproof cases around. This Emergency “911 only” cellular phone is programmed so it is clearly identified as a 911 phone with the FCC approved program code/phone number. These phones are electronically remanufactured to meet the manufacturer's specifications. All phones are cosmetically refurbished to remove scratches, dents, cracks, worn or missing parts and are thoroughly cleaned. Additionally, all batteries are new to ensure the longevity of the phone. The phones come equipped with an alkaline backup battery (long-lasting alkaline batteries stay charged for years, simply replace the battery each season). 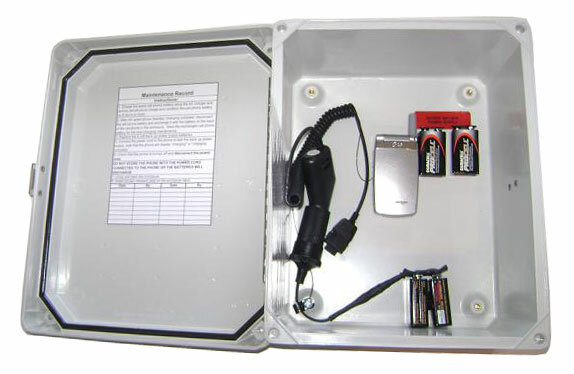 Model 209VX Includes: Portable mergency 911 cell phone with lithium ion cell phone battery, alkaline battery back up power supply, 2 spare alkaline batteries, Water-tight enclosure, stainless steel (padlock capable) door snap latch, 10 tamper resistant latch seals, stainless steel Cable (inside enclosure to phone), laminated operation instructions and emergency 911 phone label (911 label is for the outside of the cabinet). The system also includes an addition lithium ion cell phone battery and remote AC charger for maintenance. The AC209VX is a vandal-resistant and maintenance free approach for a pool phone that requires no phone service fee because it makes free 911 calls. 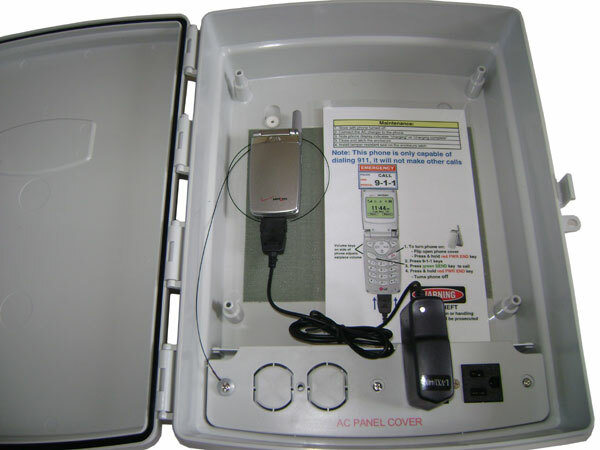 Model AC209VX Includes: Portable emergency 911 cell phone with new lithium ion cell phone battery, AC charger, water-tight nema 3X enclosure, door snap latch, 9 tamper resistant latch seals (with low effort tear off in case of emergency), theft resistant stainless steel cable (inside enclosure to phone), laminated easy operation instructions with anti-theft warning message located inside of the enclosure and emergency 911 phone label on outside of enclosure. The water-tight enclosure has 3 gasketed mounting holes, easy to install enclosure mounting hardware and a rubber AC line in cable port to the internal 110 VAC power module. 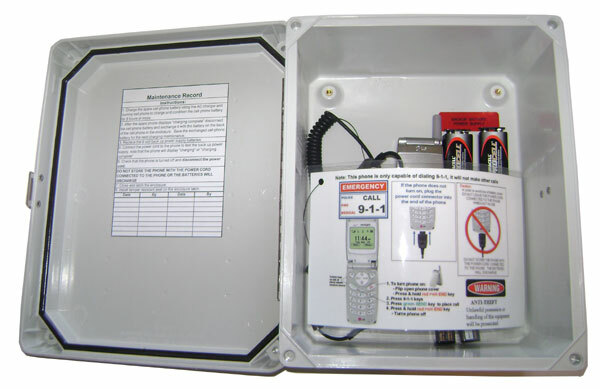 This system is maintenance free yet does require a 110 Volt AC line into the enclosure. Our best system includes a vandal-resistant and weather-resistant Nema type approach to an outdoor emergency phone installation. The weatherproof enclosure is anti-corrosive, fiberglass reinforced polyester with a secure side latch (padlock capable door snap latch). The enclosure has 4 external mounting holes and an internal mounting plate with 4 screws. Inside enclosure dimensions: H x W x D 10 x 8 x 5.59 Model V323 $159.95 Includes: Weatherproof enclosure, latch, large "Call 911" label, internal mounting plate with 4 screws. Model V323WOL $139.95 Includes all items lisited in Model V323 but without the large "Call 911" label. 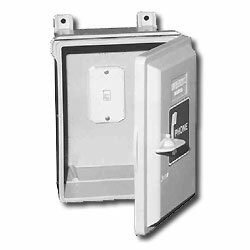 These enclosures are designed for installation of a corded phone for wire line phone systems. It is a vandal-resistant and weather-resistant Nema type approach to an outdoor phone installation. The weatherproof enclosure is anti-corrosive, fiberglass reinforced polyester with a secure side latch. The enclosure has 4 external mounting holes and an internal mounting plate with for screws. Inside enclosure dimensions: H x W x D 10 x 8 x 5.59 Model V323WJ $179.95 Includes: Weatherproof enclosure, latch (padlock capable door snap latch), wall jack/mount, internal mounting plate, large phone label, internal mounting plate with 4 screws. Model V323WJP $218.95 Includes: V323WJ Enclosure with a ATT Trimline white corded telephone. ATT Trimline white corded telephone- Best selling phone of all time, ATT quality design. 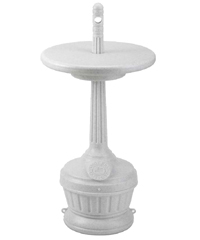 Optional pole mount brackets provide a suitable mounting surface for a variety of pole shapes. Universal bands are capable of securing the bracket to poles that are between 2.5 to 15 inches. Mount kits utilize captive screw mounting holes to prevent unauthorized removal of equipment. Model ETP-SME $649.95, ADA-compliant hands-free Emergency Phone specially designed for Swimming Pools. Model SE211606 White Smokers Outpost with table: The 15"removable table creates a practical piece of furniture. 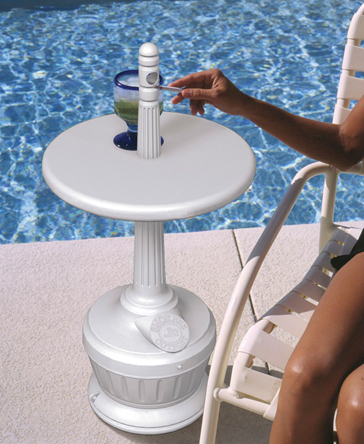 Perfect for seated areas next to the pool or on the patio. Standard screw closure and optional bolting hardware make security simple. Easy to clean! Just unlock and lift top to empty pail liner. Keeps unsightly cigarettes hidden from public view.